Hit The Road, Jack ... The industry website RadioInsight.com reported Wednesday that CBS Radio had registered the domain names KHitsChicago.com and 1043KHits.com in preparation for a format change. The move coincides with a rebranding of WJMK as K-Hits, featuring a classic hits format of music from the ’60s, ’70s and ’80s, targeting listeners between the ages of 25 and 54. While the WJMK call letters will remain intact, the new format is expected to debut Monday. It's your turn, SOUL and MOTOWN music lovers ... Scarlett's got a brand new bag full of SOUL! We are going to groove to your sweet soul music requests, so come onwich yo' come on! Time to board the SOULLLLLL TRAINNNNNN ... Thursday Nights, 7 pm ET on www.myrevolutionradio.com. And, this weekend The Sunday Night Sock Hop returns! I will be playing the best of the 50's and early 60's music, Pre-British invasion ... time to get out those saddle shoes and penny loafers again ... my poodle skirt is just back from the dry cleaners and is ready to go! YOUR REQUESTS ARE A MUST! Hello Everybody!!! Get ready for a really big show tonight!!!! 7:00 / 8:30 - Classic sounds of the 50's and 60's with a possible touch of the 40's. 8:30 / 9:00 - We will be remembering Johnny Preston. "Running Bear" is the first song that will pop into your mind but there are other songs that Johnny did. Don't forget "Cradle of Love" plus others. 9:00 / 10:00 - A phone conversation that has been long in the making. It's Dickey Lee. I can't begin to list all those great songs that he sang. Of course we remember "Patches" and "Laurie" ... Yes strange things were happening on that song. I want to talk to Dickey about his career, his selection of songs, his change from rock and roll to country music. There are so many aspects to his career. It's been over 10 years since I sat down with him in New Jersey after an oldies show and we talked for over an hour. I remember how nice he was. 10:00 / 10:30 - I'd like to remember another of my favorite singers. I will be playing something very special by Gene Pitney from the 60's. 10:30 / 12:00 AM - Time for a Doo Wop party with some special memories of The Cadillacs. It was reported that original member Bobby Phillips has passed away. The contribution to our music by this group was nothing less than phenomenal. 12:00 / 1:30 - Time for Midnight Country! This is the period when country music really was country. This week I'll continue the Whitburn Countdown of 1961 from number 80 to 61. Some nice country memories will be heard. 1:30 / 2:00 - Time for a western adventure. I haven't decided which one as yet, but you better get your 10 gallon hat and boots on for this. 2:00 / 3:00 - This last hour will be full of surprises as I wait till the last minute to decide what I want to play. I am in the process of putting together a very special Johnny Maestro night on March 25th. I can't give out the details yet, but you better put this one on your calendar. Of course next week on the 18th it will be another chapter in the music and life of Ed Rambeau. Friday evening is getting close, so make sure you are by your computer to keep me company. Remember I don't want to be alone. So be here or be square. I promise you an evening where you will hear the greatest songs that ever lived. We hadn't heard from our FH Buddy Preston Ritter ... original drummer for The Electric Prunes ... in quite awhile ... and now we know why. I was sad to get this email the other day ... but also happy to hear that Preston is doing better now ... and has the love of his family there with him. I haven't been on line for about six weeks. My computer is in storage. I'm now living with my daughter, Larissa and her husband in Oceanside. Why you ask? I almost died on January 23rd. I had double pneumonia, influenza and a lung infection at the same time. The shock to my transplanted kidney caused it to stop functioning. I was in a coma for 9 days on a ventilator. The doctors called my daughters (from Texas and Oceanside) and told them I wasn't going to make it. Everyone expected to be attending my funeral on my daughter, Hannah's birthday on the 26th. They got my kidney working again and I was in the hospital (Henry Mayo) for another month after I got off the ventilator. My muscles were like jello. I couldn't stand or walk. I had to go through rehab to learn how to walk again. I'm still trying to get my strength back. Just a few days ago was the first time I was able to get up the stairs to take a shower in about two months. I think in another month, I will be almost back to normal. My cell phone doesn't even work here, as it's a dead zone. It was sad to hear about Mark Tulin's passing, while I was in rehab. We were supposed to get together as soon as I was able. When I read the Monkees' tour schedule, I turned to my husband and informed him that we have a concert to attend in July. I'll let you know how the Greek performance was. My book Where the Action Was is now available as an E-Book. March 8 = Micky Dolenz is 66. March 9 = Mark Lindsay is 69. March 12 = James Taylor is 63. There's no doubt in my mind that Robert Gordon's place in the history of Rock 'n' Roll is definitely understated and underrated. I sang backup on a couple of Robert's albums and when Robert gathered up a couple of live shows in the New York area he asked me to put a vocal group together for him. I did, and now the Gordanaires are Jeff Lyons, Paul Rolnick and me. Here's a clip I just found on-line from the first 'Conan" show after the writers' strike ended in '08. 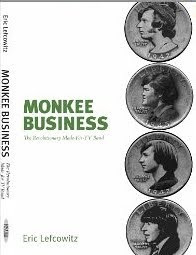 Forgotten Hits is proud to present an EXCLUSIVE Interview with Eric Lefcowitz, author of a brand new Monkees book "Monkee Business: The Revolutionary Made-For-TV Band". This isn't Eric's first foray into the world of The Pre-Fab Four ... back in 1985 he published "The Monkees Tale". This time around he's got a lot more history to cover ... and offers a few more behind-the-scenes tidbits that were "self-censored" out of the original publication. And his timing couldn't be any better ... with the recently announced 45th Anniversary Tour coming to The U.K. and The States this spring and summer, Eric's new book sits perfectly poised to become THE "must have" book on the world's all-time favorite "Made For TV" band. FORGOTTEN HITS: I recently referred to The Monkees regrouping for their 45th Anniversary Tour as perhaps "The World's Worst-Kept Secret" ... I guess I always considered it inevitable that the guys would get back together again to cash in on this milestone anniversary ... with perhaps some extra emphasis on the phrase "cash in". ERIC LEFCOWITZ: My take on it, first of all, is obviously its being done, in part, for the money. It’s also being done because there is public demand. This is not true of many groups that came out around the time of the Monkees. Of course, there are exceptions like the Buffalo Springfield who are touring. Incidentally, the Buffalo Springfield were great friends with the Monkees. But the Byrds, to use an example, decided to take a pass. It’s not easy to get these legacy groups together. Often it’s like herding cats. FH: My experience over the years (I've seen various incarnations of the band at least 25 times since the show went off the air) is that there seems to be a very loyal audience for the band ... even their solo shows tend to sell out quickly. How do you think this new batch of shows will do? They've already put together a pretty full schedule over the course of a six week U.S. tour ... and this is coming right on the heels of their tour of The U.K.
EL: I'd love to say that they are always guaranteed box office ... especially in this day and age, when it’s difficult to sell tickets and legacy rock acts are disappearing. But the truth is, it’s just a fun brand. Hearing Micky belting out hits like “I’m A Believer” and “(I’m Not Your) Steppin’ Stone,” and Davy’s classic performance of “Daydream Believer” is usually worth the price of admission. On a human interest level, there is also Peter’s recent throat cancer ordeal and hard-earned recovery. Peter's courage in the face of such a major health scare is also compelling this time around ... he not only battled the disease but then went straight back to performing live shows with his band, Shoe Suede Blues, within months of completing treatment. So, to answer your question, the shows will sell out in my opinion, but we’ll see. Last year a lot of great artists were playing to half-filled houses and cancelling dates. Still there’s something special about the Monkees. They’re more than a group; they’re also a TV show. It’s not like you see the Partridge Family playing the Beacon Theater in New York or the Greek in LA. FH: Speaking of The Greek Theatre in L.A., there's already quite a buzz building about the possibility of Michael Nesmith showing up for at least one of these shows as he did back in 1986. What do you think? Will Mike once again thrill the California audience with an on-stage appearance? EL: The rumor is, yes, Nez will make the trip. I know there’s a tendency to roll ones eyes when you hear about these one (or two) shot reunion moments but Nez answers to a different drummer. Anyway if it’s anything like when he showed up at the Greek Theater in 1986 it will be worth a plane ticket out to the West Coast. That was a truly exciting event. FH: There always seems to be a certain amount of "drama" attached to The Monkees ... they're in sync, then they're on the outs ... it seems like they spend more time criticizing each other and NOT getting along than getting along ... one cannot help but wonder if a milestone tour like this one, most likely the last time they'll all perform together, might permanently mend some of those oft-destroyed fences. EL: A Monkees tour always produces some drama. From 1967, when Jimi Hendrix opened for them, to 1997 when they last toured together as a foursome, there's always some intrigue. When you think about it, there aren't any other TV show casts touring, unless you include recent arrivals like Glee and American Idol. So The Monkees are a rare breed, indeed. FH: There does seem to be a certain amount of deep down unspoken love between them, even when they're fighting amongst themselves. While I suppose they've proven over the years that they don't necessarily need each other to survive in this business, I've also got to believe that deep down in there somewhere they also recognize the fact that they're much stronger as a team. Much like The Beatles, they're really the ONLY ones who know first hand what it was like to experience the complete MANIA that surrounded them back in the day. Does it seem at all ironic that all of this is happening right after the passing of Don Kirshner, the guy who spear-headed the early success of the band? EL: I don’t know if irony is the right word — I think sad is probably more accurate. For all that’s been written about Kirshner, there’s no denying the guy, as a promoter of great songs, was in a league by himself. I was distressed to read that he felt he had been burned by the Rock and Roll Hall of Fame (the same goes for the Monkees, of course). There are plenty of people from the business side of things that have made that institution and Kirshner truly earned that honor. He helped launch Bobby Darin (a member of the Hall), made the careers of Carole King and Gerry Goffin (members of the Hall) and promoted the hell out of many acts in the 1970s via his Rock Concert TV show. He had an amazing career but I feel it came to a sad end. In regards to the passing of Don Kirshner ... I remember Donnie as one of the "suits" that originally came out the to West Coast from New York and would appear at some of the studio sessions. At first, I really didn't know what he did. It wasn't until years later that I realized what a profound influence he had had on the choice of material that The Monkees produced. And for that, I am eternally grateful. Sad to learn of the passing of my old adversary Don Kirshner. He was a formidable foe and I send my condolences and sympathy to his family and his many friends. Donny, where ever you are -- I want you to know I put my fist thru the wall just for dramatic effect. Apparently it worked. It is all behind us now, and we wrote what we wrote. Rest in Peace. FH: This time around your new book reveals many never-before-told, behind-the-scenes stories ... what are a couple of your favorites? EL: Well, I avoided a lot of the personal stuff in my first Monkees biography, “The Monkees Tale.” First of all, much of it was hearsay and it really wasn’t my mission to dig up dirt back then. If anything I was hoping to rehabilitate the Monkees’ reputation. So mission accomplished, I guess. But this time through, since the story covers 45 years, I felt I had to add a few flourishes. I do find the business with Davy’s new marriage to Jessica Pacheco very interesting. She seems to have breathed new life into the guy because he’s definitely in control of his career right now. There was a lot of tabloid stuff written about their December - May marriage but, for now, it seems to have paid dividends for the guy and I’m happy for him. And then there were artifacts that I dug up or came my way. For example, an American fan of Paul McCartney who was stalking the guy back in 1967 interviewed him on her little portable reel-to-reel player. This girl really tries to get McCartney to slag off the Monkees (being a typical Beatles fan of the time) but Paul really rises to their defense. I quote from the interview in the book. I generally find the whole Beatles / Monkees thing fascinating because from all the evidence out there the two groups became fast friends. I can’t imagine that happening today. FH: You also share some rather remarkable revelations about Bert Schneider and Bob Rafelson in your new book ... do you think they'll show up in L.A. for the show? EL: I think Bob will probably be there. There’s a fascinating interview with Bob on the Criterion DVD of “Head” that was just released (a must see, by the way … five stars all the way). He basically says he was an a-hole and made a lot of executive decisions that were questionable. I found that refreshing. As for Bert, he was, and still is, rather reclusive and I understand he’s not well. I hope he makes it because Bert is the unsung hero of the whole Monkees story in my opinion, despite his post-Monkees abandonment of the group. FH: Tell us about the mod / penny-cover on your new book ... it's really a rather cool cover! EL: All credit goes to the amazing Duane Dimock. Some of your readers may be familiar with Duane (nee Ed Finn), who has been operating on the margins of Monkees collectibles since the mid-1980s. Anyway Duane had this idea about ten years ago and I was just waiting for the moment to be able to use it. Now he’s gone and made actual collectible coins with those images. That is truly something that collector’s should track down. FH: The book has been published under your own imprint, Retrofuture. Tell us a little bit about that. EL: Retrofuture is my publishing company. It’s not the first time I’ve published a book; that would be “Tomorrow Never Knows: The Beatles’ Last Concert”, which I wrote and published in 1987, along with the late, great photographer Jim Marshall. Today it is so much easier to publish a book. You don’t need to order 5000 copies like you had to do in the past. The trick is to make sure you hire some very talented people to design and edit the book. Fortunately I found Stephanie Thompson who is an up-and-coming designer. She did a great job. And, by the way, Forgotten Hits people, I am looking for other music books to publish, so drop a note to Retrofuture Products, PO Box 1611, Port Washington, NY, 11050, if you feel you have something interesting to share. Mostly I’m looking to re-release great music books that are out of print ... but right now I'm open to reviewing anything that has the potential to reach a music-loving audience. FH: Thanks for taking some time to talk with Forgotten Hits today ... we really do appreciate it ... and can't wait to read the new book. One final question: Is there anything that you'd personally like to see The Monkees do on this tour that perhaps might be a nice surprise for the audience? EL: I’m not sure “Goin’ Down” would be a surprise but I’d like to hear Micky have a go at that. The guy still has great pipes. FH: That he does ... we saw him last year when he opened for Peter Noone and he blew the audience away ... always one of the greatest, most under-rated singers of this era ... and his brand new CD "King For A Day" is also a very pleasant delight. Thanks again, Eric, for visiting with us today. Today we're doing a brief interview with Ron Smith, one of the original voices and braintrusts behind Chicago's Real Oldies Radio Station. What was the opening day on-air line-up for Real Oldies 1690? FH: We all witnessed a little bit of radio craziness when Ron Britain left the air. What were some of the other changes made to this line-up over time? RS: Ron Britain left after four months and was replaced by World Famous Tom Murphy (after guest shots by Clark Weber, Chuck Buell and Kris Erik Stevens). Scott Miller joined for weekends a few months later. Richard Steele did some fill-in work, as well. The staff was remarkably stable. RS: The station started during a period when WJMK was heavily into '80s music -- playing the Police and Billy Joel, etc. Essentially, they were playing nothing before 1964, when the British Invasion began. So Real Oldies 1690 was designed to super-serve that neglected core audience. Later I dubbed that the first decade of rock 'n' roll. General Manager John Gehron believed in the notion that top 40 radio was always about playing ALL the hits of the day and oldies should be no different. So we played standards from Frank Sinatra and Nat "King" Cole right along with Little Richard and Elvis. It was a delicate balancing act, but I think Program Director Tommy Edwards pulled it off admirably. In fact, we did our job so well that Infinity pulled the plug on WJMK! Now there was no station playing music AFTER 1964 (True Oldies was several months away from coming to Chicago). So the decision was made to expand the playlist to include music from all of the '50s and '60s. Some listeners were disappointed at first, but they soon realized we weren't dropping any of the older music, we were simply adding the later tunes that were now unavailable anywhere else. "Keeping the music alive" was not just a slogan to us. As for a "local flavor", the station always played local hits. In the early days it was Sam Cooke and Ral Donner. Later we added the garage bands and Chicago Sound groups. Make no mistake about it -- this was a Chicago station right down to the local countdown show I hosted. And every on-air personality knew the city intimately. FH: The most frustrating thing for me was WANTING to listen and then losing the station signal to a simply unlistenable pool of static. (In fact, I couldn't even pick it up INDOORS!) The patter of Tommy Edwards and Larry Lujack was SO entertaining in the morning on the way to work that I'd find myself suffering through the static trying to catch a glimpse of ANYTHING they were saying, rather than tuning into a different radio station with a clearer signal ... now THAT's "appointment radio"!!! (lol) Quite honestly, it was the first time I'd listened to anything on the AM dial in DECADES!! RS: Ultimately, the terrible signal did the station in. 1,000 watts at night is bad enough, but on the X-band (1600-1700 AM) it's deadly. Add to that the fact that we had no promotion budget (our entire year's worth of promotion money in 2004 was given to Kiss FM to buy TV commercials for Drex). The company would give us seven billboards they couldn't sell every January. There's a reason I dedicated my last book to the WRLL staff by saying, "Never have so few done so much with so little." RS: Clear Channel was finally able to lease the frequency to WVON for about as much money as we were bringing in but without our overhead. But I'm proud to note that WVON's ratings have never come anywhere near what ours were. Clearly we outperformed the signal. And if we had stuck around long enough for the Portable People Meters (which measure actual listening instead of recalled listening usually a week later) to be used for ratings as they now are, I think we'd have had some decent, if not outstanding, numbers. radio that people went to high school with — you not only played the music, you presented it with the talent they remembered, like the guys you mentioned — who are all great talents. What we’re trying to do is frame the music a little differently. We’re not just trying to present the music to the people that listened to it originally. This music has an appeal beyond that audience -- people of a slightly younger generation who love the music from shows like Jersey Boys or American Idol. For them, the presentation needs to be slightly different. We’re taking the opportunity to broaden the appeal to a younger generation, still playing the music those older listeners like, but presenting it in a way that the 35 year olds can relate to." Obviously Kent you must be bored. FH must not be keeping you busy enough these days. I think you will have opened Pandora's Box by asking what's an oldie. You mentioned that you will be doing a series on "What is an Oldie?". I don't know if you will take comments from your readers but I will certainly write in and give you my idea if you do. I have always said that if you took, say 10 people at random, and asked them what their definition of an oldie is, you probably would get 10 different answers. We ABSOLUTELY want responses from our readers ... and man, did we get 'em!!! It's this wide-range of responses that is going to make this poll work. And, quite honestly, we're hoping that the oldies nation listening at large will respond, too, because THEIR thoughts will perfectly help to balance those from our list readers who, like us, are here because they'd like to see the envelope pushed a little further ... and a little more often. While forgottenhits.com focuses -- as it should -- on showcasing the songs missing from "Oldies" stations' meager playlists, I think there's another, almost as important aspect to the pop music of the past: Diversity of genre. During the 1960s particularly, Top 40 radio had nearly every conceivable type of popular music: rock, country, jazz, reggae, show tunes, blues, rockabilly, surf music, easy-listening, world music, TV themes, folk, stuff that's utterly uncharacterizable (Mrs. Miller, say, or Miss Abrams and the Strawberry Point School Third Grade Class), and more. The week of January 18, 1964 is a case in point. That week, the Trashmen and the Singing Nun bumped up against each other in the Billboard Hot 100 at Nos. 5 and 6 respectively, and I defy anyone to name two less similar songs than "Surfin' Bird" and "Dominique"! They shared air time with Jan & Dean, Chubby Checker, Connie Francis, Al Hirt, Pete Seeger, Martha & the Vandellas, Bobby Vinton, Cliff Richard, the Beach Boys, the Supremes, Roy Orbison, the Ronettes, and jumping in at No. 45, "I Want to Hold Your Hard", by some brand new English group. It was a rich stew of styles, not only entertaining a wide variety of people of all ages, but also educating them about music types, and introducing them to unfamiliar material. Where's the diversity of genre on today's "Oldies" stations? Which Czar decided that only three or four types of music can properly be called "Oldies"? Would a fan of Elvis or the Shirelles enjoy the music of jazz organist Jimmy Smith? Perhaps not, but in May of 1962 they could at least give him a listen and decide for themselves, because all three acts were on the radio. These days -- forget it, because Jimmy Smith apparently hasn't been blessed by the Archbishop of Oldies. Urging programmers to play some once-popular but now largely forgotten hits is noble work! And it should be accompanied by requests to broaden the very definition of "Oldies." No one knows better than you that there's a LOT of great unheard stuff out there. I couldn't agree more, Henry ... music has been segregated for SO long now that a lot of people don't remember that ALL these different styles used to be played side by side at one time. We have been pushing for AGES now to see more variety in oldies radio programming. How badly does oldies radio need a face lift? How desperately do they need variety and personality to continue as a viable format? ... it happens FAR more often than you might think ... so I hit the button AGAIN, switching over to The Drive ... and THEY were playing "Night Moves" by Bob Seger. There was simply no escaping this song! The fact that these three stations (and probably half a dozen more in Chicago alone) program this song into their regular play list shows you how seriously LACKING of variety radio really is these days. There is absolutely NOTHING here to distinguish one channel from another ... at some point, they all sort of blend together into one numb background hum that we don't even really listen to anymore ... it's all become "surface noise" ... making it all that much more likely that if somebody actually had something new or interesting to SAY on the radio, we may not even recognize it or hear it! That's why these "Wow" songs jump out at you the way that they do ... hearing virtually ANYTHING off the beaten-to-death play list is an attention grabber. Because you can hear everything else literally ANYWHERE else. Some of the very best features on The Drive include Album Sides Thursdays and selecting 2000 songs from their MASSIVE play list and then playing them back, A-Z, with new surprises added each and every time they run this feature; Bob Stroud's Rock And Roll Roots program, Ten at 10 (featuring ten great songs from one great year), and One 45 at 1:45. THESE are the kinds of things that will help to change the face of radio ... and listeners tend to wait for them to come on so we can listen ... all of this equals APPOINTMENT RADIO. ... we WILL remember it when we hear it again ... and feel a certain excitement that we just DON'T experience when hearing "Born To Be Wild" or "Satisfaction" for the 7th or 8th time today. There IS a reaction ... and it's a GOOD reaction ... it's something that these radio programming consultants can't gauge because they themselves aren't seeing and experiencing it. They're looking at a list of songs on paper ... NOT taking into consideration the reaction one might experience by hearing something that's not already ON the list. Now the argument will be from these know-it-all radio consultant experts that "Sure ... WE recognize it because we were there when it was all brand new the first time around ... but our 'core audience' won't know what it is" ... to which I reply "And just whose fault is THAT?!?!? You've kept this music locked up and off the airwaves for so long now that it truly IS all but forgotten. Give your 'new' audience a chance to discover it for themselves and draw their OWN conclusions." Now I'll be the first to admit that they're not all winners that should immediately jump to the top of the repetitive play list ... many of these songs don't deserve more than an occasional spin at best ... but when used as a tool to break up the monotony of the same songs day in and day out, they become even MORE powerful to your listening audience ... and they ALSO let your listeners know that YOU remember these tunes, too! The topic has come up more than a few times over the years ... what exactly IS an oldie? With the wealth of oldies fans who regularly read and participate with Forgotten Hits, we're expecting to receive a wide range of answers on this one. Several arguments can be made ... and HAVE been over the years. Some folks on the list will say that the REAL oldies ... the records and artists that helped to shape and form Rock And Roll Music from its infancy ... stopped the minute The British Invasion invaded our shores back in 1964 ... that Rock And Roll Music is an AMERICAN invention, plain and simple ... and NOTHING post-1963 should be considered an "oldie". They consider the onslaught of British Rock to be "the day the music died". Others will say that it ended even earlier than that ... that once the "Founding Fathers of Rock" gave way to the "pretty boy teen idols", rock and roll music became so diluted that it ceased to exist. Other "oldies experts" will say that rock and roll music ended the day that Elvis Presley was drafted ... or the day that Buddy Holly's plane went down! Over twelve years of putting together Forgotten Hits, one point we've seemed to prove time and time again is that the music that MOST affected your life is probably what you were listening to at about the age of 12 or 13 or 14 ... THIS is the music that has left the most long-lasting impression on your being ... it's where your greatest affection for music exists. With that thought in mind, a "desirable demographic" would mean that a 40 year old today (born in 1971) would most appreciate the music of 1984 / 1985. Someone like myself (born in 1953) was most affected by the music of The British Invasion ... I missed "The Early Years" of Rock And Roll but loved what I heard SO much that I went out and investigated and rediscovered this music on my own. (And fess up ... isn't there at least some small part of you would would absolutely LOVE to slap the 24 year old, lower end of this "desirable demographic" who boasts with great pride ... when something by N*Sync or Destiny's Child comes on the radio ... the groups that launched, respectively, the MEGA careers of current pop stars like Justin Timberlake and Beyonce ... "Oh My God!!! I remember this song from when I was just a kid!!!" We want to hear from you ... what IS and what ISN'T an "oldie"??? Is it a period in time? Or is it a "state of mind"? Is it something as chronologically simple as "anything that's at least 25 years old?" Or is it a bygone era of basic musical development? More than a few deejays on the list will testify that they were forbidden from uttering the dreaded "O" word on the radio ... we ran through a period of time where you didn't DARE say the word "oldies" to your audience ... the general feeling was that you would be insulting them by calling them "old" ... so instead catch phrases like "The Greatest Hits Of All Time" and "The Soundtrack Of Your Life" came into fashion instead. But the fact is we ARE old!!! But we are still very passionate about this music ... we LOVE it!!! But we ALSO consider this music to be "timeless" ... and believe whole-heartedly that it's there to be discovered and embraced by a whole new generation of listeners who will fall in love with it, too! We were very fortunate here in Chicago to have two radio outlets that embraced the "oldies" branding ... and went so far as to boldly name their stations "Real Oldies" and "The True Oldies Channel" ... and made absolutely no apologies for doing so. The original vision of these stations was to cater to the baby boomers who grew up loving this music. We'll take a closer look at both of these stations over the next several weeks ... and encourage your comments on this topic. Are songs that belong on the oldies channels more "artist" dictated? Two immediate examples that come to mind are "Kokomo" by The Beach Boys and "You Got It" by Roy Orbison, both late '80's tracks that found an immediate home on the oldies stations. Is it because both of these artists are held in such high regard in the oldies community? Is it because these songs seem to fit in with the style normally associated with these artists? To me, oldies is an era ... we just need to decide how much of that era we want oldies radio to capture with their play lists. So PLEASE, let your voice be heard on this. We're taking it to The Oldies Nation at large and asking for THEIR take on what does and doesn't belong on an oldies station. Maybe between ALL of us we can help to build the PERFECT oldies station ... one with enough of those "special features" to keep you tuned in all day long ... so please weigh in on this ... and know that the "powers that be" are listening! Due to still MORE technical difficulties ... hey Blogger, do you EVER read your "Help Line" comments??? Your fonts, spacing, sizing, copying and pasting and saving and deleting functions have been messed up for WEEKS now ... and it's REALLY getting frustrating!!! ... we've had to email this week's edition of The Sunday Comments ... AGAIN ... and are only able to post the music here as a cross-reference to this week's edition. Meanwhile, you'll kind of have to jump back and forth between the email and the website today in order to cross-reference the music in the newsletter. BLOGGER ... PLEASE fix this ... it is VERY annoying and frustrating ... I'll bet I've got close to six extra hours in this project this weekend alone simply because your site isn't working properly!!! Thank you!